Above: The first recorded purchase of Shakespeare’s Venus and Adonis, less than two months after it was entered in the Stationers’ Register. Richard Stonley, a government accountant, spent 12 pence on two books, Venus and Adonis and John Eliot’s The Survey, or Topographical Description of France, in addition to 10 shillings on food and 3 shillings, 12 pence on clothes. Since 1997, UNESCO’s Memory of the World Register has raised awareness of the state of preservation of civilization’s documentary heritage by nominating a series of books or other documents that speak to our common history. Looting, war, illegal trading, and general lack of interest stirred UNESCO members to establish an annual list of documents that have national or global social relevance. The first inductees into the program included the Archangel Gospel of 1092, a collection of Mexican Codices, and a Holy Koran, and since then the register has grown to include the Magna Carta and the Gutenberg Bible. This international initiative calls for the preservation or, in some cases, the reconstitution of a country’s documentary heritage -- creating a sense of permanence for these materials in an increasingly impermanent (read: digital) world. This year, 90 documents relating to William Shakespeare’s life have been added to the register, mostly dealing with his baptism, burial, property records, and business transactions. Six of those documents hail from the Folger Shakespeare Library collection -- the only American institution included -- while the remaining 84 documents are in the United Kingdom’s Shakespeare Birthplace Trust, the National Archives, Worcestershire Archives and Archaeology Service, the College of Arms, the British Library, and London Metropolitan Archives. The Shakespeare documents are accessible to anyone with internet access: they’ve all been scanned and uploaded to an online repository called “Shakespeare Documented,” launched on the 400th anniversary of the Bard’s death in 2016. With (appropriately) 400 items in its holdings, the site bills itself as “the largest and most authoritative resource for learning about primary sources that document the life and career of William Shakespeare.” This comprehensive portrait of the playwright offers hundreds of print and manuscript documents for in-depth examination, including contemporary accounts (and gossip), anthologies, literary criticism and diary entries--all providing testimony to how Shakespeare became a household name. “The fact that these resources -- supplied by a number of institutions -- have been digitized and are widely available means that a vital part of the documentary record is able to speak to us from centuries past. If libraries are diary of humankind, this group of documents represents one of that story’s most exciting chapters,” said Folger Shakespeare Library Director Michael Witmore. In an age where longevity of e-data is of increasing concern, to quote the Bard himself, “What’s past is prologue” (The Tempest, Act 2, Scene I). In other words, we cannot forget history’s lessons, or we are forever doomed to repeat them, and UNESCO’s initiative is a positive step in the right direction. Credit: Richard Stonley. 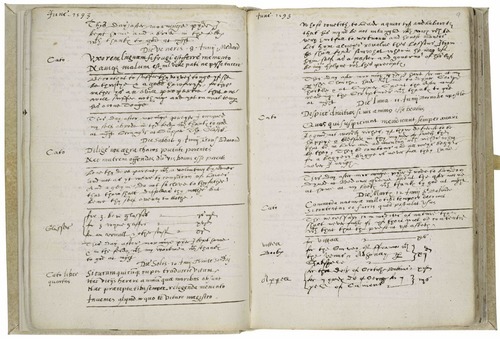 Diary labelled “KK.” Manuscript, May 1593 to May 1594. Folger Shakespeare Library. Above: The first recorded purchase of Shakespeare's Venus and Adonis, less than two months after it was entered in the Stationers' Register. Richard Stonley, a government accountant, spent 12 pence on two books, Venus and Adonis and John Eliot's The Survey, or Topographical Description of France, in addition to 10 shillings on food and 3 shillings, 12 pence on clothes. Since 1997, UNESCO's Memory of the World Register has raised awareness of the state of preservation of civilization's documentary heritage by nominating a series of books or other documents that speak to our common history. Looting, war, illegal trading, and general lack of interest stirred UNESCO members to establish an annual list of documents that have national or global social relevance. The first inductees into the program included the Archangel Gospel of 1092, a collection of Mexican Codices, and a Holy Koran, and since then the register has grown to include the Magna Carta and the Gutenberg Bible. This international initiative calls for the preservation or, in some cases, the reconstitution of a country's documentary heritage -- creating a sense of permanence for these materials in an increasingly impermanent (read: digital) world. This year, 90 documents relating to William Shakespeare's life have been added to the register, mostly dealing with his baptism, burial, property records, and business transactions. Six of those documents hail from the Folger Shakespeare Library collection -- the only American institution included -- while the remaining 84 documents are in the United Kingdom's Shakespeare Birthplace Trust, the National Archives, Worcestershire Archives and Archaeology Service, the College of Arms, the British Library, and London Metropolitan Archives. The Shakespeare documents are accessible to anyone with internet access: they've all been scanned and uploaded to an online repository called "Shakespeare Documented," launched on the 400th anniversary of the Bard's death in 2016. With (appropriately) 400 items in its holdings, the site bills itself as "the largest and most authoritative resource for learning about primary sources that document the life and career of William Shakespeare." This comprehensive portrait of the playwright offers hundreds of print and manuscript documents for in-depth examination, including contemporary accounts (and gossip), anthologies, literary criticism and diary entries--all providing testimony to how Shakespeare became a household name. "The fact that these resources -- supplied by a number of institutions -- have been digitized and are widely available means that a vital part of the documentary record is able to speak to us from centuries past. If libraries are diary of humankind, this group of documents represents one of that story's most exciting chapters," said Folger Shakespeare Library Director Michael Witmore. In an age where longevity of e-data is of increasing concern, to quote the Bard himself, "What's past is prologue" (The Tempest, Act 2, Scene I). In other words, we cannot forget history's lessons, or we are forever doomed to repeat them, and UNESCO's initiative is a positive step in the right direction. Credit: Richard Stonley. Diary labelled "KK." Manuscript, May 1593 to May 1594. Folger Shakespeare Library.